The Nursery Rhyme began to be printed in England as early as 1570! The Nursery Rhyme, which up to this point been passed to different generations verbally, started to be passed on via the written form. Printing allowed the production of books and cheap pamphlets, or Chapbooks. A chapbook is "a small book or pamphlet containing poems, ballads, stories, or religious tracts". More people during this time were learning to read but the chapbooks were also popular with people who could not read as they contained pictures, in the printed form of crude wood engravings. 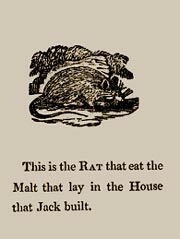 The Chapbook was a Middle Age equivalent of a Children's comic - documenting funny rhymes and Folklore! A Picture of a Chapbook page dated 1820. The House that Jack Built Nursery Rhyme. Chapbooks were sold by 'Chapmen' or peddlers who sold, amongst other wares, the popular penny Chapbooks at local fairs! The Chapmen sold various wares that were easy to transport from one village or fair to the next. They attracted attention by dancing and singing the old familiar Rhymes! The word 'Chap' originates in Middle English, from the Old English 'capman' meaning 'trade' add this to the word 'cheap' to provide a full definition of a Chapman. (You now know the origin and meaning of the name Chapman!) These old Chap books, sold by the Chapmen, have given us most of our old Nursery Rhymes! English Ballads, Folklore and old legends were also documented in Chapbooks and sung by wandering minstrels which helped to continue the spread of the old Nursery Rhymes and Legends. The Chapbook was a cheap, small book, containing 24 pages or less without a hard cover. Chapbooks were usually anonymous and undated. The popularity of Chapbooks increased during the 1600's, 1700's and 1800's but only a few of the early copies have survived. The contents were committed from memory which accounts for some variations in the lyrics and words of some Nursery Rhymes. The leading chapbook printers including John Marshall, published, printed and sold in Aldermary Churchyard, next to the Church of St Mary Aldermary, Bow Lane in 1780. Aldermary Churchyard was situated East and south of St. Mary Aldermary Church, from Budge Row to Bow Lane. It is also of interest to note that Newbery Publishing House, who published "Mother Goose's Melody - or Sonnets for the Cradle", was originally set up in St. Paul’s churchyard. The content and material of the Chapbooks expanded in the 1700's to include children's stories like Robinson Crusoe and various versions of Perrault’s Fairy Tales. The Identity of Mother Goose & her Nursery Rhymes!